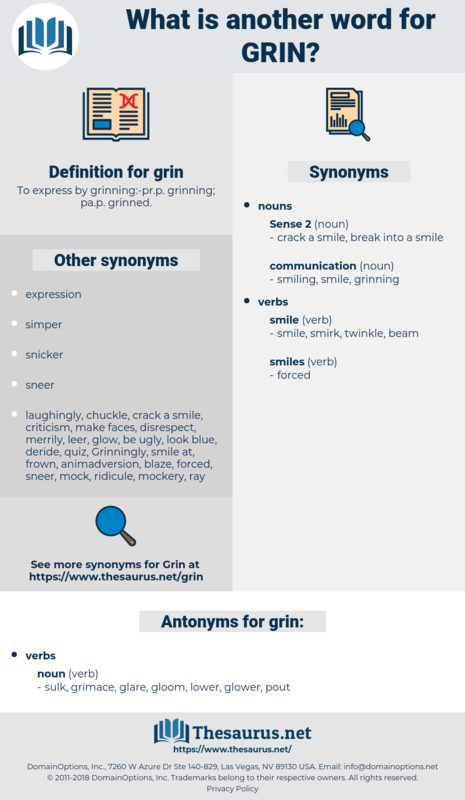 What is another word for grin? To express by grinning:- pr. 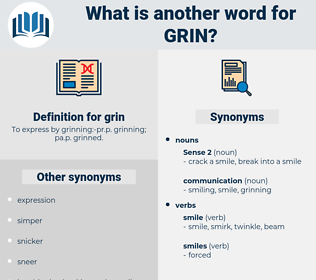 p. grinning; pa. p. grinned. withs sound be in stitches. sulk, grimace, glare, gloom, lower, glower, pout. No. Mr Murray likes fishing, replied the lad, with a grin; and he shall hold the line till there's a bite. But I could sleep middlin' without that, answered the man, with a grin. gramma, greene, Grume, granny, grannie, germy, grainy, graham, grayhen, garonne, giriama, guarani, green onion, grime, geryon, grimm, grey hen, green, groan, gram, gurney, gran, groom, german, gramme, grain, gray hen, groyne, grama, germane, germanium, greeneye, gagarin, grahame, greyhen, grown, grimy, Gramineae, germany, geronimo, groin, germ, geranium, greenway, grim.